The Barber Who Wanted to Pray arrived on our doorstep this morning, one day after Reformation Day. But that's ok. We'd been talking about Martin Luther all weekend with the kids and so when we saw this book come in, well, we just sat down and read it right quick! This book is a new release from Crossway, and a new children's book by R.C. Sproul. These facts alone made me think it would be a hit in our house. I was curious to read it with my kids. As I mentioned, it arrived this morning and we read it this morning, on the heels of Reformation Day. The Barber Who Wanted to Pray opens with a scene in the McFarland family home. The McFarland family (all with Irish names, as you might imagine) are gathered around their table at the end of the day to do their family devotions. After Mr. McFarland has finished praying, one of his daughters asks her father how it is that he learned to pray so beautifully. Mr. McFarland launches into a story about Martin Luther that is based on fact. While this is a picture book, it does read very much like a children's sermon. If you are looking for entertainment, then this probably won't be your cup of tea. I actually liked the book though because it presented who Martin Luther was to the young reader, explaining some of his work in sparking the Protestant Reformation. It also is instructive as to how even a young child can pray. At the back of the book it includes the text of The Lord's Prayer, Ten Commandments and Apostles' Creed for easy access. All in all, I would say that as a teaching tool that is interesting to look at, as it is laid out in an easy to comprehend manner, this book is very well done. It suits its purpose very well. Added bonus for me? 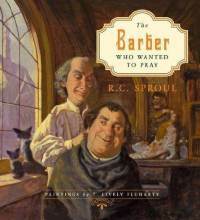 The Barber Who Wanted to Pray is illustrated by the same fellow who did Fool Moon Rising, T. Lively Fluharty. I like his style and knowing that he illustrated it gave me an instant warm feeling towards the book. I'm glad to have this resource available for the future, not just to use when talking about Martin Luther and the Protestant Reformation, but also to talk about creeds, faith and prayer. It's fantastic! Thank you, Crossway Books, for sending a copy of this title my way to check out. I appreciate it! My youth pastor gave me a pamphlet called "Martin Luther's Quiet Time" years (and years) ago. I still have it and am still inspired by it. This way of making it accessible to an even younger audience is exciting to me. I was curious about this book for my kids! Thrilled to see you were able to review it! Thank you! The one getting his hair cut on the cover kind of looks like R.C. Sproul. haha! I really like his children's stories.